Phlox stolonifera is the botanical name for a plant commonly called "creeping phlox" (see below for help distinguishing this plant from another, more popular plant with the same common name). 'Home Fires' is the cultivar name of the particular type that I, myself grow. Phlox stolonifera 'Home Fires' is categorized by botanists as an herbaceous perennial. It is also considered semi-evergreen. What Does Phlox stolonifera 'Home Fires' Look Like? At maturity, this plant stands at about 10-12 inches tall when in bloom (6 inches when not in bloom), with a width of two or three times that. Because it forms dense colonies, the width of an individual plant actually won't be apparent after a while, since it will blend into the whole. The foliage is a mix of narrow leaves in the upper part of the plant and rounded leaves below. The flowers are pink and come in clusters. These fragrant flowers bloom in mid-spring. The species plant from which the cultivar derives is native to eastern North America. You can grow Phlox stolonifera 'Home Fires' in planting zones 5-9. This perennial is perhaps best used as a shade garden plant, although some growers are successful locating it in sunny areas as long as they faithfully furnish water when the soil dries out. We grow ours in partial shade. It has just average water needs but does require a soil that is friable and drains well. 'Sherwood Purple,' which has purplish-blue flowers. 'Pink Ridge,' which is another type with pink blooms (but the pink color is brighter than on 'Home Fires'). 'Blue Ridge,' which bears violet-blue flowers. If we had to choose between the two in picking a ground cover, I'd select P. subulata. It stays shorter and blooms more prolifically. Phlox stolonifera also invites comparison with P. divaricata, which is known as "woodland phlox" (in fact, the label that came with my Phlox stolonifera refers to it as "woodland", not "creeping" phlox, although the latter is the more widely used common name for the plant). Since it spreads via stolons to form a blanket across the earth (indeed, the specific epithet, stolonifera, means "bearing stolons"), it should come as no surprise that the classic use for this plant is as a ground cover. It is also effective as an edging plant. Wildlife gardeners will be interested in the fact that they are also plants that draw butterflies and are used, as well, in hummingbird gardens. 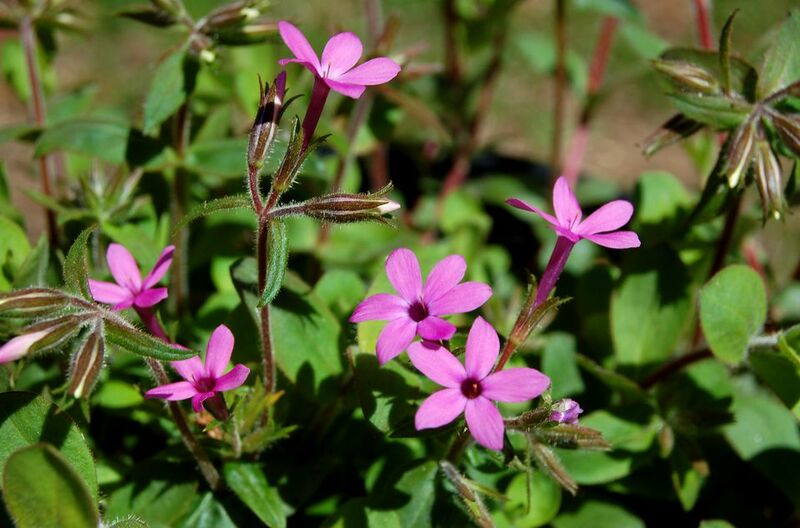 Learn more here about the various types of phlox.